The explosive growth in the availability of smart phones in societies around the world – even in some of the poorest, most remote communities – is increasingly leading many groups to explore how these devices might be used effectively as part of large scale data collection efforts. Advantages of mobile phone data collection are: speed, accuracy, convenience, training. Major focus is not however mobile data collection itself, but from the beginning (collection of data via mobile phone) to the end framework that enables to drive specific actions quickly and that is easy to integrate in the existing system. Data collection via mobile is the complementary point integrated within larger monitoring and evaluation frameworks, processes and activities. The orientation to use the tools is not merely just to collect data, but to drive responses to help remediate specific actions quickly. So that it is important to select the tool that can provide from the beginning to the end framework and that is easy to embed in the existing system. 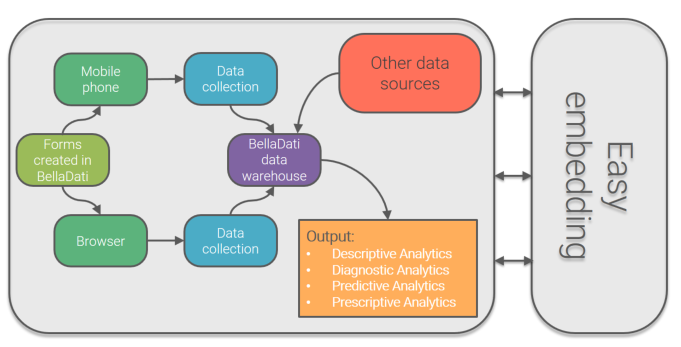 BellaDati Advanced Analytics Framework enables mobile data collection, can be easily embedded in the existing system and provides full range of advanced analytics features from descriptive analytics to prescriptive analytics. BellaDati Advanced Analytics Framework is agile, so that as such it provides for fast implementation resulting in lower costs.